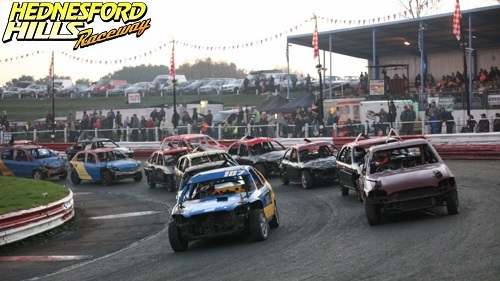 It’s hard to believe it has been 10 years since the first Man Of The Midlands Championship was staged at Hednesford Hills Raceway. Time flies as the saying goes. On Sunday 4th November 2018 the annual season finale fireworks spectacular takes place at the ¼ mile banked oval venue and taking centre stage will be the Bangers Man Of The Midlands Championship! This year there is a change in category of Bangers competing for the Man Of The Midlands Championship with the ‘Back To Basic’ Bangers having the opportunity to compete for the title. Who will be crowned the 10th anniversary champion?? ‘Back To Basic’ Bangers have brought the fun back into Banger racing and with the rules restricting or prohibiting certain makes of cars it has meant drivers have searched and found all sorts of different types of cars to race and on occasions already this season we has seen many weird and wonderful models appear to be raced and sent to the scrapyard in the sky! Who’d of thought a VW Beetle or a Lada would win a race!?!?! The meeting format will be announced in due course and is subject to the number of cars booked-in to attend so we ask for drivers to help with the organisation of the event by booking-in please. Drivers can book-in by calling 01252 322920, on the text service 07501 828911, by email info@spedeworth.co.uk or complete the drivers booking-in form via the link below. We are pleased to announce the support once again of Gamble Motorsport and Wulfsport International as the headlining sponsors. Regular race fans and drivers to our Incarace venues will recognise Dave Gamble who is always in attendance come rain or shine with the Gamble Motorsport / Wulfsport stand where there is a wide variety of merchandise available so don’t forget to pay Dave a visit. Dave will as always be offering a mixture of prizes which will be announced in the coming weeks and like previous years Dave has said, “the better the booking list, the better the prizes”. Plenty of incentive to get booked-in for the event if you are planning to have ago and join us at one of the highlight fixtures of the Hednesford Hills Raceway calendar. First race of the day starts at 2pm and as we go into the evening and under the flood lights the racing only gets better! The countdown has started to crown the next Man Of The Midlands!